Prosthodontics is the branch of dentistry that replaces missing teeth. A prosthesis replicates as well as possible the function of the missing part, provides structural support for the remaining tissue, and improves one's appearance. Teeth can be lost from the trauma associated with an accident, the ravages of decay, and periodontal disease. Teeth can also be congenitally missing (missing from birth). It is important to replace them to prevent the shifting of the remaining teeth, for chewing, and for esthetic reasons. A bridge replaces one or more missing teeth by being permanently cemented or bonded to teeth adjacent to the space caused by the missing tooth or teeth. In a healthy mouth with all the teeth present there is a natural balance of the teeth to neighboring teeth in the same arch and the opposing arch. Forces of mastication (chewing) are distributed equally among the teeth. Figure 1 shows thirty-two well-aligned and functioning teeth. In Figure 2 the lower first molar has been lost. If this tooth is not replaced, the remaining teeth can shift, resulting in an unbalanced occlusion (bite). This places excessive forces on the remaining teeth. Figure 3 shows what can happen several years after the loss of a tooth that has not been replaced. 1) The molar above the space can super-erupt (move downward into the space below it), disrupting the bite. 2) The gingival tissue (gum) in the extraction space is subject to trauma. 3)The teeth on either side of the space can drift and tilt, destroying a properly functioning occlusion. 4)The tilting teeth create areas where food impacts, making cleaning difficult, which can lead to decay. 5) Food impaction areas can also lead to periodontal disease. 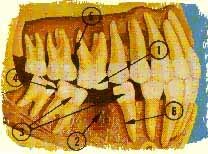 As teeth drift and tilt there can be loss of the supporting bone around these teeth, leading to periodontal disease. By constructing a fixed bridge before the teeth have a chance to drift and tilt, many problems with the bite can be avoided. 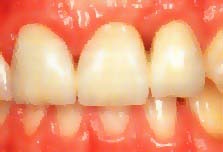 Figure 4 shows the bridge in place; all the teeth are in a normal, balanced occlusion. A fixed bridge is a precision-made prosthesis that will restore proper function and, in areas that are visible, achieve a high degree of esthetic acceptance. A porcelain-fused-to-metal bridge was constructed to replace this front tooth lost in an accident. There is a metal substructure that provides strength and durability for the bridge. The fused porcelain provides a life-like appearance to the bridge, making this bridge look and feel as natural as the original tooth. Two views of damage to this patients front teeth from an accident. The damage was repaired by utilizing a fixed bridge. This young patient was missing her two permanent cuspid teeth. Two bonded bridges were made to restore her smile and replace the missing teeth.